Admitting you’ve never cheered for a favorite during the races at the Blockhouse Steeplechase is a faux pas on par with disclosing you’ve never polished off a plate of pulled pork at Tryon’s Blue Ridge BBQ Festival. Two very different events, yes; both must-dos for any self-respecting local. 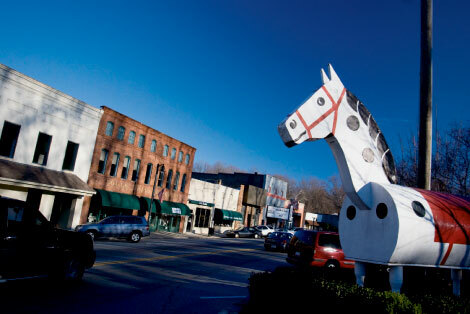 And even if you’ve taken the time to watch the horses compete in the four National Steeplechase Association-sanctioned races or entered your slow-cooked brisket in the barbecue contest, it’s entirely possible you’ve neglected to carve out time to explore downtown Tryon. Teetering on the border with South Carolina, this spot isn’t the sleepy hamlet you’d expect from a town of fewer than 2,000 people. Multiple galleries and bed-and-breakfasts, a wine bar, movie theater (the only one within 28 miles), and a fine arts center provide cosmopolitan convenience without spoiling the first-name basis most locals are on. There’s no time like the present—or the weekend of April 18, the date of the next Steeplechase—to get acquainted with Tryon. Inside a 40,000-square-foot showroom, Architectural Warehouse [151 Southern Mercerizing Rd., (828) 859-2297] is where the unexpected—a pristine gold 1974 Fiat 600R—is parked among the striking relics salvaged from grand homes. Do-it-yourselfers might experience delusions of home-improvement grandeur. Breathe. Take in the antique pie safes, reclaimed doors, and a stained-glass lamp or two, before checking out larger items. The best of the best is here, including many masterpieces from Argentina and Peru. “A lot of people call this place a museum,” explains sales associate Kyle Fisher. It’s true, reading the tags on the multitude of pieces is like a crash course in architectural history. A book could easily spend its entire life in Tryon, passing from one literature fan to the next, with plot twists that land it in one of a trio of downtown bookstores. With crisp pages anxious to be opened, it could arrive as a special order at The Book Shelf [90 Pacolet St., (828) 859-9304], a go-to spot for regional titles and best sellers since 1952. After several reads, a new owner could discover it on a shelf beside the hundreds of used volumes at Chris Amato’s The Village Book Shoppe [16 Maple St., (828) 859-0273]. Finally, once its pages have yellowed, it might be welcomed to the club of esteemed rarities that fill the shelves at Noah’s Ark Book Attic [31 S. Trade St., (828) 859-5141]. In the otherwise low-key shopping district, Simply Irresistible Gallery [66 Ola Mae Way, (828) 859-8316] lends a splash of color and personality. The building, painted in electric blue, lime green, Grape Ape purple, hot pink, and sorbet orange is rivaled by the vibrant art inside, which ranges from photography to sculpture to wearable pieces. Owners Kathleen Carson and her husband, Bill Crowell, fill the gallery with work from Southeastern artists, including her own brilliant, painted tile work and his metal pieces made next door at Saluda Forge. Before you leave, make friends with one of the many kitties that play and nap in the gallery. This is the time of year that Marianne Carruth, organizer of the 31st annual Super Saturday Children’s Theater Festival, starts getting phone calls from grandparents. “They all want to know what the theme of the parade is going to be,” she says with a laugh (it’s The Wild Wild West this year). On March 21, several venues will host musical, comedy, storytelling, and dance performances, with each ticket just $1. In addition to the stage acts, a magician, puppeteer, and crafts stations will entertain on the streets. “A lot of parents who grew up here and saw the shows as kids come back with their own children,” Carruth says. Kentucky can keep its Derby, mint juleps, and manicured track. Tryon has the Blockhouse Steeplechase, where it isn’t uncommon for spectators with elaborate tailgate displays to start mixing Bloody Marys before the first jockey takes his mount. There is also a hat contest and a Parade of the Hounds put on by the Tryon Riding & Hunt Club, all at the Foothills Equestrian Nature Center [3381 Hunting Country Rd., (828) 859-9012]. If you’re looking for a place to stretch your legs, check out Pearson’s Falls [Route 176], four miles north of town. A quarter-mile trail leads to the 90-foot waterfall. Your pup will have to stay behind, but you can bring a picnic. There’s plenty of healthy grub to fill your basket at grocer Nature’s Storehouse [427 S. Trade St., (828) 859-6356]. If the streets are empty around noon, it’s a safe bet that you’ll find a crowd at 10 North Trade Café & Bakery [10 N. Trade St., (828) 859-3010] contemplating which special to order—the salmon Caesar salad, scotch-broth soup, or a turkey sandwich made with the house-baked sourdough. Diners plan their visits by the weekly bread “calendar”—Tuesday offers sweet potato pecan and deli rye, Wednesday is banana or fig walnut, and so on. Take home a peanut butter thumbprint cookie topped with a dollop of peanuty goodness and drizzled with chocolate. Don’t ask for Simon at Simple Simon’s Sweets & Savories [112 N. Trade St., Ste. 1A, (828) 859-9204]: The owner’s name is Graham. This ice-cream wizard is quick to recommend favorites from the smorgasbord of homemade flavors (he had me pegged with the tangy pineapple lemon). But the treat folks wait for all year is the blend named after the Steeplechase made with toffee, caramel, and chocolate pieces folded in chocolate ice cream. It may not sound completely original, but since it’s only served the week of the race, its absence for the other 358 days of the year makes the heart grow fonder. Nighttime is the right time to hit the Lilac Wine & Piano Bar [120 N. Trade St., (828) 859-5205], where a rotating lineup of pianists stroke the keys each evening. The music and vino theme even blends with the décor: Deconstructed baby grands fulfill second lives as a wine rack and another as a table. If you plan to pop in for one glass before a later engagement, owner Doug Arborgast warns that you might just forget your plans and order another glass. He sees it happen all the time. It isn’t difficult to imagine gentleman in riding jackets and boots congregating in the Fox & Hounds Bar at the 1906 Pine Crest Inn [85 Pine Crest Ln., 1-(800) 633-3001] for glasses of scotch. The room, with its hunter green tones, stone hearth, and brimming bookshelf hints at the rich English country house décor you’ll find in the quarters of the main house, as well as a handful of cottages that dot the property. Don’t pass up the chance to dine at the acclaimed restaurant that serves dinner Wednesday through Saturday (reservations are required). Though the menu changes frequently, you can expect the likes of lamb chops with red jalapeño jelly and warm Vermont goat cheese or the seared maple leaf duck breast with mushroom potato hash and rosemary jus. Each Thursday, the Tryon Wine Society hosts a tasting at the inn led by owner Carl Caudle. If you want your friends to think you were roughing it in the mountains, rent one of three log cabins across from Harmon Field [1 Harmon Field Rd., (828) 859-5784] and pose for a shot outside one of these early 1800s structures. The rustic façade won’t give away the fact that inside, the renovated buildings are outfitted with modern kitchens and other amenities. These and more properties are available through Blaze Realty [(828) 859-2474, www.blazerealtygroup.com]. But the biggest perk of the cabins is their proximity to the field’s paved walking trails, putting green, and playground. And it just so happens that’s where the barbecue festival will be held June 12-13, in case you get a craving for some of the best barbecue in the Southeast.